The Bata Shoe Company established a sister company in Hungary in 1931, which nevertheless did not develop its activities. After a political decision the South of Slovakia was annexed by Hungary and a Bata factory and a part of the retail network found themselves in the Hungarian territory. This was followed by a new factory set up in the Tisa valley. After 1945 the Bata Hungarian company was excerpted from the Bata property. 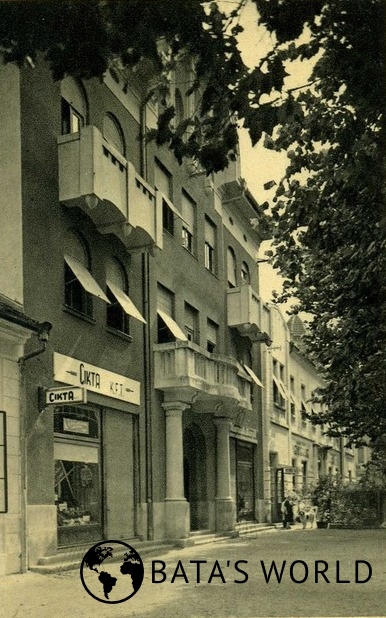 In the year 1931 a company Magyar Bata Cipöipar, r. t., Budapest was founded; its establishment became official in the spring of 1932, but nevertheless during 1932 -1933 the firm did not conduct any business. In the year 1935 the Bata Company received a judicial warning about its obligation to issue a balance and in the spring of 1936 the Bata Company officially deleted its Hungarian firm from the register. The export of the Bata Company to Hungary gradually decreased: 118, 000 pairs (in 1928), 18, 000 pairs (in 1932), 6, 000 pairs (in 1935) and 16, 000 pairs (in 1938). On 11th October 1938 a sister company Cikta, Cipögyártási és kereskedelmi társaság kor. fel. Komárom was established with the headquarters in Nové Zámky; Cikta took over the business of the Bata Company in the former Czechoslovak territories annexed by Hungary – the factory Nové Zámky and a retail network consisted of 120 stores; in the year 1941 after the occupation of Yugoslav Vojvodina, another 69 stores came under the management of Cikta. In the spring of 1940 the Cikta Company asked for a permission to build a factory in Martfü – the Hungarian Government granted the permission in order to support decentralisation of industry in the country. 1940 – the Cikta company bought 300 ha of land in the valley of the river Tisa, in Martfü near Tiszaföldvár. 1941 – the architect Jiří Voženílek, who worked in the Bata´s Company Central office in Zlín, made an urbanistic plan of an industrial and estate area in Martfü and the same year the construction of the factory began. In the year 1942 production in Martfü began after relocation of leather shoes production from the factory in Nové Zámky (where the rubber workshop remained). In August of 1943 the headquarters were also transferred to Martfü, as well as a major part of production from Nové Zámky; construction of the production and estate area continued. During the years 1942-1943 several buildings were finished, among them factory buildings, a group of family houses and a boarding house for the unmarried. The number of employees in factories Nové Zámky and Martfü gradually increased: from 1,142 (in 1939), to 1,881 (in 1942), and to 2,392 (in 1944). On 14th October 1942 a sister company Kotva, Budapest was founded for trading with various goods. After the war, parts of the Cikta Company were divided according to the restored states and their territories, Nové Zámky in Czechoslovakia and Martfü in territory of Hungary. In the year 1945 the factory in Nové Zámky was nationalised in accordance with the Czechoslovak laws; the issue of the Bata Shoe Company property in the Hungarian lands was solved by a Czechoslovak-Hungarian protocol from 25th July 1949 – and the company became the property of the Hungarian state.